This is my first post here, so thanks in advance to the community, you guys rock. About 6 months ago I came across a pair of Klipschorns for sale locally here in Alaska (I’m terrified to think what the shipping might have been on these) for a steal at $800. I checked them out and they sounded absolutely, completely amazing. They are in great shape and all the major veneer is near perfect with a few pieces of veneer side stripping missing, shouldn’t be too hard to fix. The seller inherited them and didn’t know much about them but thought they were from 1986. I have been doing my homework on the Khorns but I am having a difficult time figuring out exactly which model/year these horns are. I more than suspect the crossovers are not original and am wondering if the mid-horns have been altered by some previous Klipsch fan in the past. I have tried to match up the x-over with the photos by Crites and these certainly don’t fit. Here are some photos of the x-over, tweeter horn, mid driver, and the overall speakers. Any help with the ID of these things is appreciated. And any advice for future upgrades/restorations for a young guy on a budget is very much appreciated. Oh, I currently have them running off a Marantz 1060, at least until I build my dream tube amp. Thanks again K-forums, as I learn more about these knockout speakers I’ll be sure to give back to the forums. …. And for the record, I paid more for these speakers than I did for my car. Could be Speakerlab, patterened after Klipschorns, but made in the Northwest (Seattle, I think). 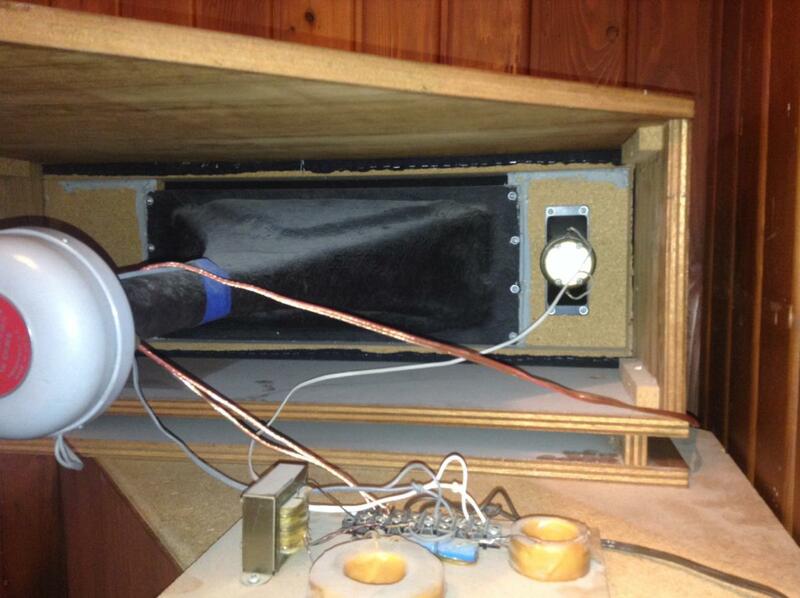 Speakerlab used the vertically oriented tweeter to one side of the midrange horn, as shown in your picture. Klipsch used a horizontally oriented tweeter directly above the center of the mid horn, at least if we are talking about the '80s or after. There are arguments favoring each of these two orientations. Also, Klipsch no longer used the round magnet tweeter, but had a square magnet type by 1986 (may have started about 1981). The two tweeters are nearly identical in design. Klipsch's midrange driver would have been labeled "Klipsch" or "PWK," but it was actually made by the maker of yours (Atlas), for a while, and again, now. I've heard that the sound is quite similar to that of the Klipschorn. Cameron1, Welcome to the Klipsch Forum; Congratulations on your purchase! Even if they aren't true Khorns, they were still a good purchase at that price as long as they are well made. I figure shipping to Alaska for a set of Khorns would be that much! How do they sound? 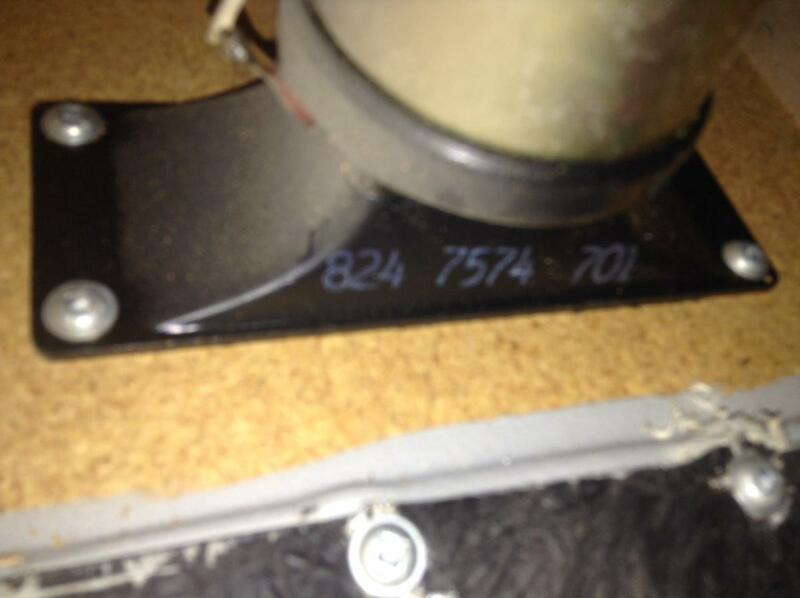 If the cabinet measurements are accurate to original, you could always put Klipsch drivers in it. All of that is available on Ebay on a regular basis. Bob Crites sells them new as well. Crossovers are also available used or new in those places. As said, don't worry about the speakerlab speakers. If they are factory made by Speakerlab, you are in really good shape. If made from plans, as long as they were constructed well, you are good. Listen and if they sound good be happy. They look really nice in the pics. Very good deal at $800, especially local. Crossovers are and easy change if you decide on that. A friend of mine had some Speakerlab Ks -- they sounded absolutely wonderful. Great price either way. A PD4V is not even similar in response to a PD5V. 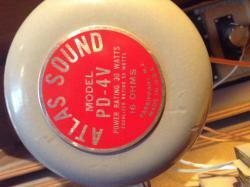 I suggest you find a pair of PD5V/K55V and sell the PD4V. Thanks for all the feedback, I really appreciate it. I have followed a few of the leads you all have posted and am pretty sure the x-over and the mid horn are Speakerlab/ DIY clones. The front grill is also probably from Speakerlab. However, I still can't determine if the bass bins and the top cabinets are Kilpsch or clones. The mid horn and front grill look like they have been kinda forced into the top cabinets with some screws and caulking. The tweeter is original Kilpsch (or so says Ebay). I guess my next step it to take a peak at the subs and see if they match up to anything. And yes, the Crites upgrades for the crossovers is something I have looked into. I have also considered a DIY wood mid-horn upgrade with a new grill and cloth...something funky and cooler than black. Volti Audio might be an option some day, who knows. Thank again for the feedback, i'll keep looking and asking around on these. I guess if they are clones then it's kind of a relief, I certainly feel way better about hauling them to a house party. I'm digging the plain glazed doughnut crossovers . Makes me want to run down to Krispy Kreme for a box . One of my brothers lives in a home behind the shop on Hwy 17 . It smells incredible over there ! Sorry to hijack you're thread Cameron1 . Good catch, DJK. But I'm curious what would it be lacking? Response down to the upper limit of the bass horn? Or what? A PD4V has no phase plug. As such its response is a big peak centered around 2Khz. With an agressive notch filter, and a tweeter that can be crossed around 3.5Khz, the PD4V can sound great. In the past I used many of them. Cameron if you are hauling the clones to a party make sure they are placed tight into the corners of a room or the speakers will not have good bass response. 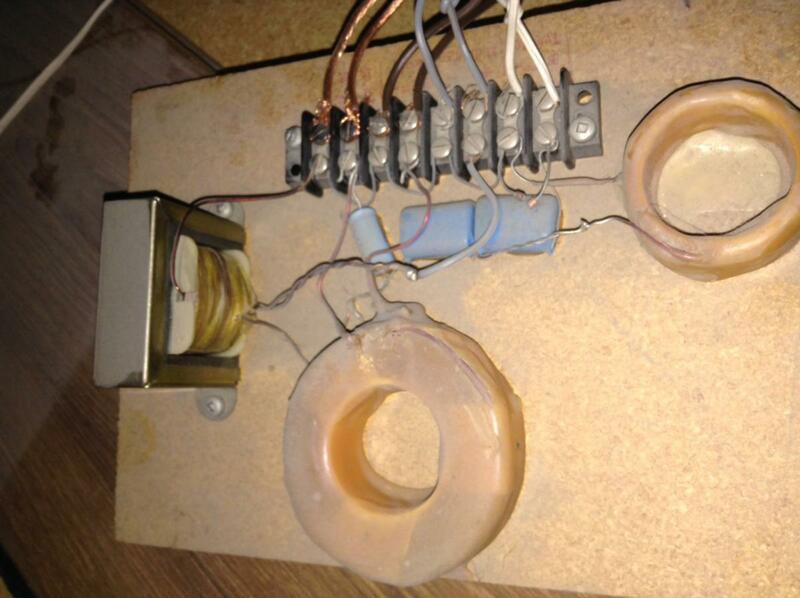 As mentioned by others, what you have is not a K-Horn from Hope, but rather a variation on a SpeakerLab SK. Three of my friends have SK's which they built in the late '70's (we're not in the same location any more). I also collected some literature from SpeakerLab. In those years SpeakerLab filled a market for speaker kits. For example Heathkit had for decades made build it yourself kits for electronics. There is a mindset of builders: I want to build it myself, gosh darn. SpeakerLab sold kits for a wide variety of speakers but the top of heap was the SK. With the SK there was the possibility to order things a la carte (my term). Just plans, or wooden parts, wooden parts with walnut, or drivers, mid horn, crossovers, etc. There was an evolution of these too. They at one time had a plastic midrange horn, which was replaced by a metal horn (which you seem to have). At one time they were selling MDF bass horn parts and then went to plywood, at least for the bass horn. It may be that walnut parts were always on MDF. It is a bit of a custom job, I think, that the builder of yours used a collar between the bass horn and the "top hat." I have not seen that SL did that. There were at least two crossover assemblies, offered. One used L pads, another used switches and resistors. Yours does not seem to be either of these. There were at least two tweeters offered by SL. One was very elemental. Yours is not that. The better ones I'm not sure. It was close to a T-35 EV. SL sold two woofers, saying they were 15 ohm and 8 ohm. Overall, I believe you have the work of craftsman who started with some parts from SL and then did the rest according to his best thoughts. In the late 1970s, Speakerlab sold the Electrovoice T35 tweeter as an "exact replacement for the Klipschorn tweeter." At that time this was true. Maybe that's what your seller meant by "original Klipsch." 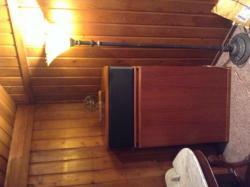 Speakerlab used the T 35 in their "K." As far as I know, Klipsch never made their own tweeter. In the 1960s, they bought round magnet EV T35s and re-labled them Klipsch. Before that, they used University tweeters. In both cases they tested them and picked ones that tested the best. In that sense, they were Klipsch, in that they were hand selected by Klipsch. By the middle '70s, when Speakerlab was making their "K," and using EV T35s, quality control was just fine. I have two round magnet EVT35s from that time on our bedroom home brew system, and they sound as good as the flat magnet Klipsch tweeters in our Klipschorns in the main listening room / home theater. So, your tweeters are probably fine. If they are labled "Klipsch," or "PWK," then your seller must have aquired them by buying replacement parts from Klipsch, or canabalized them from some Klipsch speakers. I'd say it makes no difference. I believe DizRotus abused four of the SpeakerLab SKs hauling them around as a dj business.